We understand that parents have many questions when trying to decide on a dance program, it's an important decision! 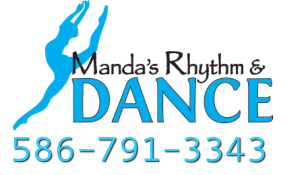 Please don't hesitate to call the studio or e-mail the office at info@mandasdance.com, for additional information if needed. How long is the dance session? We run our classes following the school year. We have the same schedule from September to June and a separate summer session for July and August. Classes for the 2018/2019 year start on September 10th. Yes, we have a recital held every year on the second Saturday of June at the professional, Macomb Performing Arts Center. We hold fun and organized recitals with age appropriate dances and costumes. What are the fees for the recitals? For the June recital a costume is required. Costumes are typically $70 per class. Audience members are required to purchase a show ticket. What is your tuition policy? Register for more than one class and each additional class is 10% off. If you pay for 10 months up front, get one month free! Tuition is divided into equal payments regardless of the number of weeks in a month. Tuition is automatically deducted on the 1st of each month. Every family is required to have a credit card on file for auto-pay if the year is not paid in full. Tuition is based off of a 37 week schedule and is divided into 10 equal payments for your convenience. More info can be found by reading the studio policies. Are there refunds if my child is absent? Since each child holds a spot in class we don't offer any refunds or class credits due to absences if we are holding classes. If there is another class of the same style for that age, your child may do a make-up class. Please call to arrange before attending a make-up class. How should I register for classes? Register online, call, or stop in at one of our locations. Yes, $15 per family for returning students, $20 per family for students that are joining the school year session for the first time. This fee is payable when starting the September- June session and is only once a year. No registration fees for the Summer session! See the Classes page for the dress and shoe requirements. How do I make a payment online and log-in to my account?